· "The foundation of Christian faith: the 'Blood of Jesus' gives life to each and every creature". · “God in Jesus offered His own life (Blood) is our Christian faith affirmation of love". · "Good Friday is a day to remember Jesus, who shed his blood for all". · “Christ did not donate one or two units of his blood to give life who is hospitalised. · The gift of blood is the gift of life from God and there is no substitute for human blood. · At every Eucharist service, the Christians partake of the symbols of the body and blood of Jesus, to remember that His body that was broken and His blood was shed to give life to all. More over, Hebrews 9:12 confirms the symbolism of blood as life. “He did not enter by means of the blood of goats and calves; but he entered the Most Holy Place once for all by His own blood, thus obtaining eternal redemption". · About 4 Crore units of blood are required, out of which only a meager 40 Lakhs units of blood are available. · Every two seconds someone needs blood. · More than 38,000 blood donations are needed every day. · More than 1 million new people are diagnosed with cancer every year. Many of them will need blood, sometimes daily, during their chemotherapy treatment. The NYCCiA observes that, there are several people around us who are in need of blood. Our blood becomes a life support for the needy, when we offer it, like the sacrifice of Jesus on the Cross. May our lives become channels of life-giving blood to many. 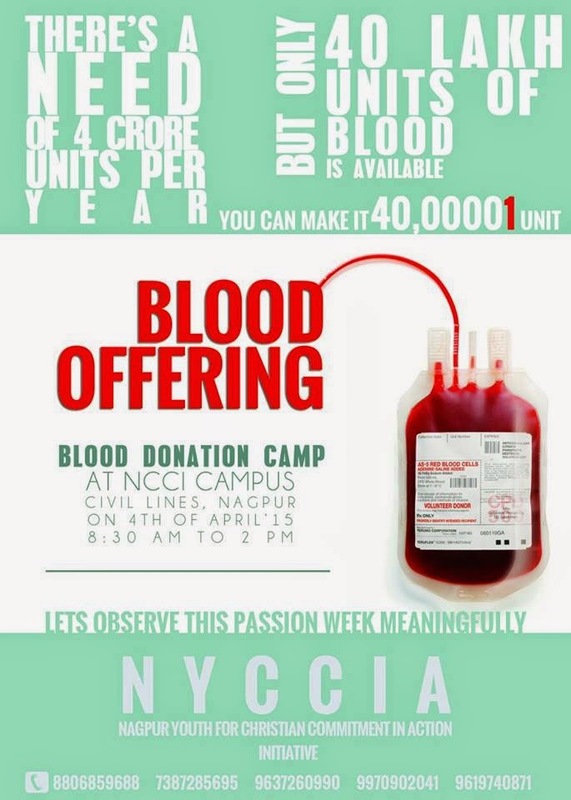 Therefore, NYCCiA have decided to observe the Good Friday meaningfully and memorably by organizing a BLOOD DONATION CAMP on Saturday, 4th April 2015 at the National Council of Churches Campus, Civil Lines, Nagpur - 440001. The NCCI - CJPC invites all its members and local congregations to observe the same. Please let us know if you have are planning one. Come, let us be a part of the redemptive act of Jesus by offering our blood.